Medley at Mirada is an up-and-coming 55+ community in San Antonio, Florida. Located within the master-planned Mirada development, this age-restricted enclave will feature its own private amenities plus access to the world-class amenities found throughout Mirada, which will include a 15-acre lagoon, resort-style pools, and clubhouses. With abundant amenities, a variety of home options, and a location just 30 miles north of downtown Tampa, active adults will want to consider Medley at Mirada for active adult living in the Tampa Bay area. Residents of Medley at Mirada will have private access to the community's own age-restricted amenities plus all of the amenities throughout Mirada. Medley at Mirada will include its own clubhouse, fitness center, resort-style pool, and courts for tennis and pickleball. Active adults will also enjoy the world-class amenities found throughout Mirada, including a planned 15-acre Metro Lagoon by Crystal Lagoons, the largest amenity of its kind in Florida. Residents will also have access to an additional clubhouse, fitness center, and resort-style pool, as well as fire pits, picnic pavilions, outdoor grills, and courts for tennis, pickleball, and bocce. The outdoor amenities will continue with an off-leash dog park and a birdhouse village. Several miles of walking and biking trails, as well as golf cart paths, will weave throughout the community’s green spaces and shaded playgrounds. Builder Lennar Homes plan to build 858 attached and single-family homes total, while the entire Mirada development will include an estimated 5,000 homes. Homes throughout the 55+ community will be bordered by ponds and wetlands conservation areas. Attached homes will range from approximately 1,396 to 1,731 square feet and will begin at two bedrooms. Many homes will feature welcoming foyers, open concept floor plans, and kitchens built for entertaining. Single-family homes will range from approximately 1,683 to 2,775 square feet with two or three bedrooms. Homebuyers can choose up to an attached three-car garage. Features in some homes will include granite countertops, stainless steel appliances, and double ovens. Homes at a higher price point can include private pools and spas. Residents will enjoy a low-maintenance lifestyle thanks to a homeowners’ association that will take care of exterior home maintenance. With more free time, active adults can take advantage of their free time by enjoying the community’s upscale amenities or exploring the Tampa Bay area. Active adults will have the opportunity to participate in many clubs, classes, and events hosted at the community clubhouses. Planned events include pickleball tournaments, movie nights, sunset socials, scheduled outings, and more. 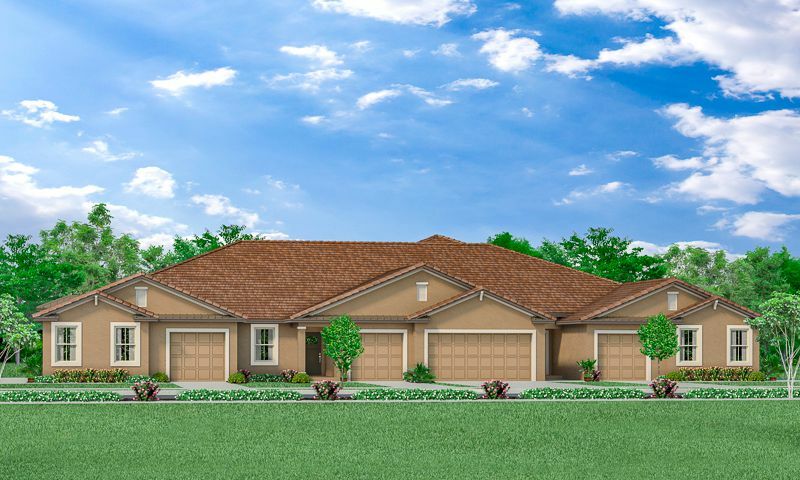 Medley at Mirada will be located in San Antonio, Florida just 30 miles north of downtown Tampa, putting residents in easy reach of daily needs and fun opportunities. Residents will be close to any daily conveniences they need, including Publix, Save A Lot, Winn-Dixie, and Walmart, as well as Walgreens, CVS, and Magnolia Pharmacy. When dining out, restaurants such as Taco Son, OTB Delight Cafe, and The Winghouse of Wesley Chapel will be found nearby. When residents are looking for entertainment options, they’ll find them at Cobb Theater of Grove 16, Heritage Park Stage, TreeHoppers Aerial Adventure Park, and Dade City’s Wild Things. Nearby shopping malls include the Tampa Premium Outlets and The Shops at Wiregrass. Active adults who want to get outside will find plenty of options close by. Golfers will find multiple courses to play nearby, including Tampa Bay Golf & Country Club, Lexington Oaks Golf Club, and Abbey Course at St. Leo University. There will also be multiple greenspaces and parks to choose from, including San Antonio City Park, Dade City Dog Park, and Lakeside Oaks. The nearby Colt Creek State Park will provide over 5,000 acres of wilderness area ideal for fishing and outdoor recreation, as well as 65 miles of trails for walking, hiking, biking, and horseback riding. Medley at Mirada will also be close to multiple health care providers, including Advent Health Dade City, Advent Health Wesley Chapel, and the Florida Medical Clinic. Residents who want to visit nearby metropolitan areas are in luck, as they can drive approximately 30 minutes south to downtown Tampa, providing easy access to everything the city has to offer. Within an hour’s drive west, active adults can reach several pristine Gulf Coast beaches that are ideal for a day on the water. For longer trips, the Tampa International Airport will only be 40 minutes away. Check back soon for more information on the lifestyle in Medley at Mirada. Attached villas offer an ideal choice for active adults who want to downsize and live low-maintenance lifestyles. These villas will range from around 1,396 to 1,731 square feet. Most will have two bedrooms. Desirable features in many villas will include inviting foyers, open floor plans, and gourmet kitchens. Single-family homes will offer more living space and customizable features. These homes will range from about 1,683 to 2,775 square feet. Many will have two or three bedrooms with an attached garage that can fit up to three cars. Most homes will feature stainless steel appliances, granite counters, and double ovens. 55places.com is not affiliated with the developer(s) or homeowners association of Medley at Mirada. The information you submit is distributed to a 55places.com Partner Agent, who is a licensed real estate agent. The information regarding Medley at Mirada has not been verified or approved by the developer or homeowners association. Please verify all information prior to purchasing. 55places.com is not responsible for any errors regarding the information displayed on this website.